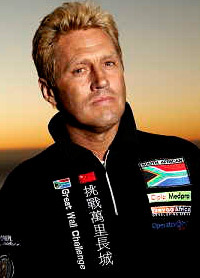 Braam Malherbe is an extreme adventurer, conservationist, youth developer, motivational speaker, TV Presenter and author of the best seller “The Great Run”. Braam has an infectious energy, that is fed by his life-long passion to protect the environment, which has inspired countless others to do the same! Adventures are compelling, but it is Braam’s thinking and positive attitude that inspires. His story is one of meeting impossible challenges, pushing limits, taking action and protecting the environment. Braam is a highly sought after keynote and inspirational speaker – both on the South African and international speaking circuit, where he receives standing ovations and rave reviews. From early on in his school days, Braam dreamt up and completed extraordinary distance runs to raise awareness and funds for conservation. Staying true to his passion, he has been involved in counter poaching operations as an Honorary Ranger for SANParks, co-founded the Table Mountain National Park’s Volunteer Firefighting unit, and is actively involved in numerous NGOs, conservation groups, making it his life’s mission to fight poaching, environmental irresponsibility and the destruction of our precious natural resources. Braam believes that ‘desperate times call for desperate measures,’ and is thus, at 54 years of age, he took part in an 760km unassisted ski-race to the South Pole with his friend Peter van Kets in December 2011/January 2012, finishing in 3rd place. Besides attending the race commemorating the Scott and Amundsen’s achievement of being the first people to reach the South Pole, Braam and Pete also feature in a documentary highlighting the human impact on this most remote of places as well as the rest of the planet in the last 100 years.